McAllister Street, a popular bike route where SFMTA’s Muni Forward planners want to speed up the 5-Fulton, would have stop signs replaced by traffic circles at two intersections under the agency’s latest proposal. Under the plan [PDF], which must be approved by the SFMTA Board of Directors, McAllister would become the first street to get traffic circles on a bus route. Up for debate, however, is how well they’ll serve their intended purpose of calming traffic enough to ensure drivers yield to pedestrians and don’t squeeze out bike commuters. The proposal for traffic circles at Lyon and Steiner Streets is a substitute for the SFMTA’s original proposal for traffic signals at five intersections. Neighbors protested the plans for signals on McAllister and Haight Street, arguing that they would encourage drivers to speed and hurt “neighborhood character.” Both streets carry major Muni lines that hit frequent stop signs as they head to and from the western neighborhoods. On McAllister, transit-priority traffic signals are moving ahead at two of the five intersections — Broderick and Scott Streets. They were dropped at Baker and Pierce Streets. 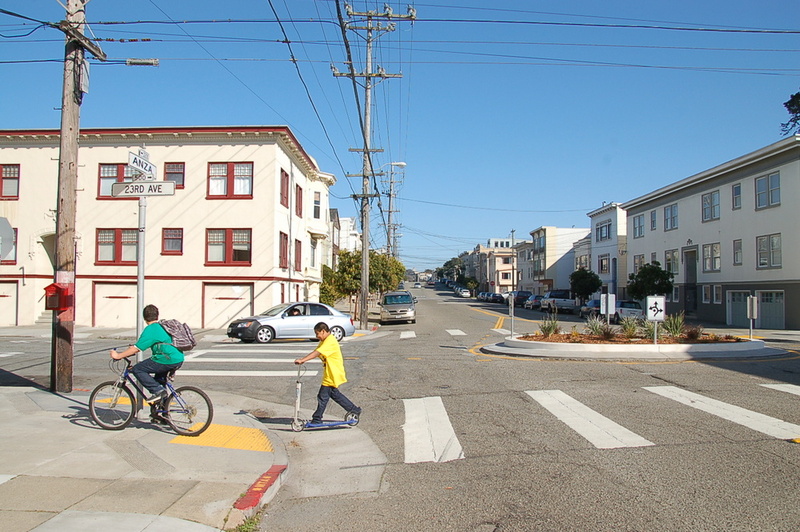 “The idea is there’ll still be stop signs for the side streets, but McAllister would have no stop sign, and the circles would be the calming feature for vehicles heading along McAllister,” said Muni Forward Program Manager Sean Kennedy. The proposed McAllister plans allow for… enough space that traffic will not need to slow down to pass through the intersection. Traffic circles also pose a greater risk to cyclists who can’t been seen by cars moving through the circle. These measures will save the 5 Fulton less than 90 seconds on its route downtown, while putting those of us who live and walk and ride on McAllister every day with our families and children, at risk. According to Tenaglia, “about 30 people spoke up at the hearing in opposition to the plan” at an SFMTA public engineering hearing on July 10. Detailed designs for the traffic circles aren’t publicly available, so it’s tough to say whether they’ll be enough of a speed deterrent to get drivers to consistently stop for people crossing the street, while ensuring people on bikes aren’t squeezed into a more narrow space in the intersection with buses and cars. The circles may have to be smaller than normal for buses to maneuver around them. SFBetterStreets.org, a city website designed to serve as an info center for residents about street improvements, says traffic circles “should not be located on transit routes.” Kennedy said he thinks circles “work great in certain situations such as this,” but couldn’t say yet whether they’ll be used more widely on other streets with bus routes. Traffic circles haven’t been implemented widely in San Francisco. The only one installed in recent years was in the Richmond at Anza Street and 23rd Avenue, where it’s seemed to work well. No bus lines run through the intersections, and 23rd is an official bike route. SF Bicycle Coalition Communications Director Chris Cassidy said “traffic circles can be a valuable tool to reduce speeds and keep people driving, walking and biking safer,” but the organization is “looking forward to SFMTA sharing more details about” the McAllister project. 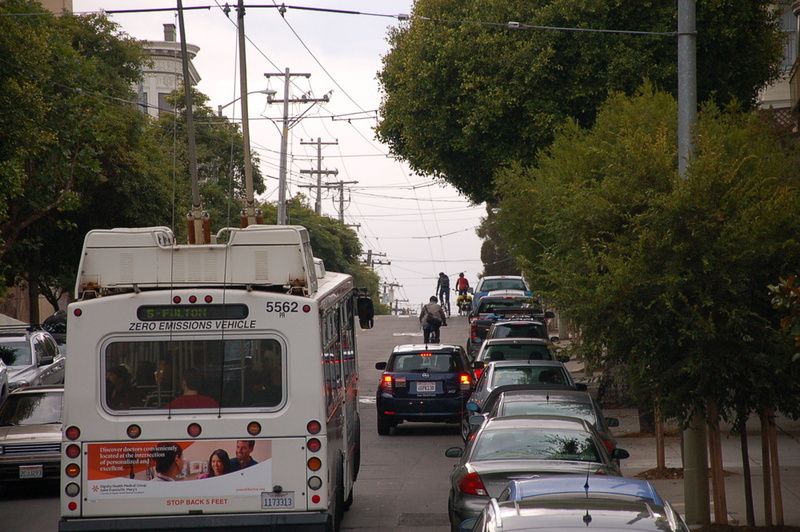 As a bike route, McAllister is the least steep, calmest, and most direct street in the area connecting the western neighborhoods and Civic Center through the Western Addition. It has sharrows that direct bike riders to mix with bus and car drivers, but installing bike lanes would seem to require the politically daunting prospect of removing all car parking on the street. Really? Because I still see that vehicles (cars and bikes) will have no incentive to yield to pedestrians, especially in the north-south crosswalks. And putting the circle in the middle of a small intersection forces vehicles to swerve into the crosswalks just to get through. It looks like the same design and problems to me (in fact). I’ve walked, taken MUNI (including the 10/12 bus) and driven in this area for over 20 years including when Broadway was a tow-away zone. Broadway/Columbus is a very busy pedestrian corridor. Traffic circles are best used in lower pedestrian areas including the ones used in Berkeley. Anyone who drives (including 10/12 MUNI bus lines) on Broadway with two lanes would never be in the right lane since that lane is always backed up by cars turning right yielding to pedestrians crossing the street. Having a traffic circle would basically turn two lanes into one lane (assuming the traffic circle would have one lane) entering the traffic circle from both Columbus and Broadway which would force all traffic to stop behind those waiting for pedestrians to cross while exiting the circle. A traffic circle at this intersection is one of the worst possible ideas you can have. It would force those on Columbus AND Broadway corridors to merge with each other within the circle. Columbus is already gridlocked most of the time P.M. so why would anyone want gridlock on Columbus to spread onto Broadway due to a traffic circle? The right-of-way goes to those motor vehicles already in the circle so motor vehicles will gridlock the neighboring streets waiting to enter the circle. The 10/12 buses stop on the SE corner of Broadway which could also protrude into the circle and could further exacerbate accessibility. There’s no good reason to have a traffic circle in a densely populated intersection, and I would guess no traffic engineer would entertain your notion for the reasons I outlined above. If he can’t answer that question as an unqualified yes, then he shouldn’t do the project. SF Placing Traffic Circles is to make it look beautiful and place blockade in middle of the road causing distractions.